Hello people of the internet! We all have those days or possibly weeks when we just depend on a strict routine with our makeup. When we couldn't do without those key products in our makeup bag. 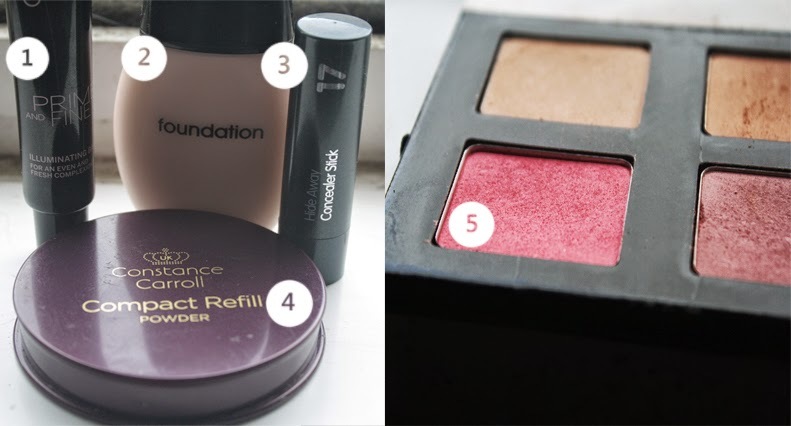 Today I'm going to show you my everyday makeup products! My absolute go-to items for face, eyes, and lips. 1. Catrice Prime and Fine primer: It's an absolutely perfect illuminating primer. I prefer stuff that makes my face matte as aposed to "dewy" but this is great for just a slight shine. Added bonus; it smells amazing! 2. Poundland Foundation: I'm currently inbetween foundation at the moment and I bought this just to get me by. This foundation is surprisingly great. The coverage is exactly as much as I need. It also lasts all day and all night without touch ups. 3. 17 Hide Away Concealer: This concealer is like packaged like lipstick, It's simple to use and has great coverage. 4. Constance Carroll Compact Powder: I just use a transluscent powder that I found online. My foundation gives me enough coverage that I don't feel a need for anything else. Like I said I also really like that matte look too. 5. W7 Blush: This blush is very pigmented so I don't need to use a lot. It gives me perfect rosy cheeks. 1. Primark Liquid Eyeliner: Like most people these days, my go-to look is winged eyeliner. I mainly use this to go over regular eyeliner that I use as a rough outline. Once again, I'm suprised at how long this stays. It's almost gone and I really have no idea what I'm going to do without it. 2. 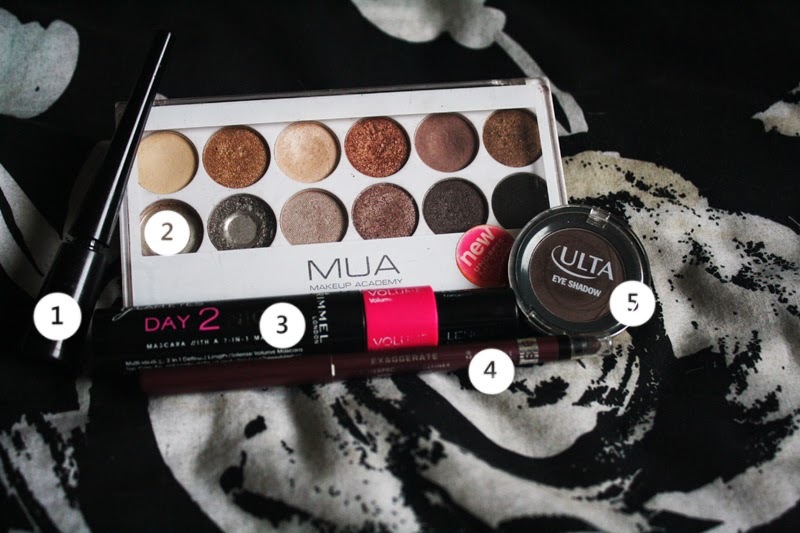 MUA Undress Me Too Palette: The cheap alternative to pretty much all Urban Decay Naked Palettes. I bought this in August last year and oh my. I have blue eyes so all of the browns really compliment my them. I use it for everyday but it's also great for night time looks. 3. Rimmel Day2Night Mascara: The best part of this mascara is the choice between length or volume. I didn't think there would be much of a difference but it works. It's even better when you combine the two. 4. Rimmel Exaggerate Eyeliner: I use this for my bottom waterline and for a rough outline for my winged eyeliner. It's great if you don't want your eye makeup to look too dark. 5. Ulta Eyeshadow: My best friend sent me this from America and it is Heavan sent! This is mainly used for filling in my eyebrows or for the crease of my eyelids. 1. Wet'n'Wild Lipstick: This lipstick guys... I have been in search of the perfect, affordable, red lipstick for a while now and this is it. It's matte and stays for about 12 to 15 hours. It seems to stain your lips as well. I love it! I love it! I love it! 2. 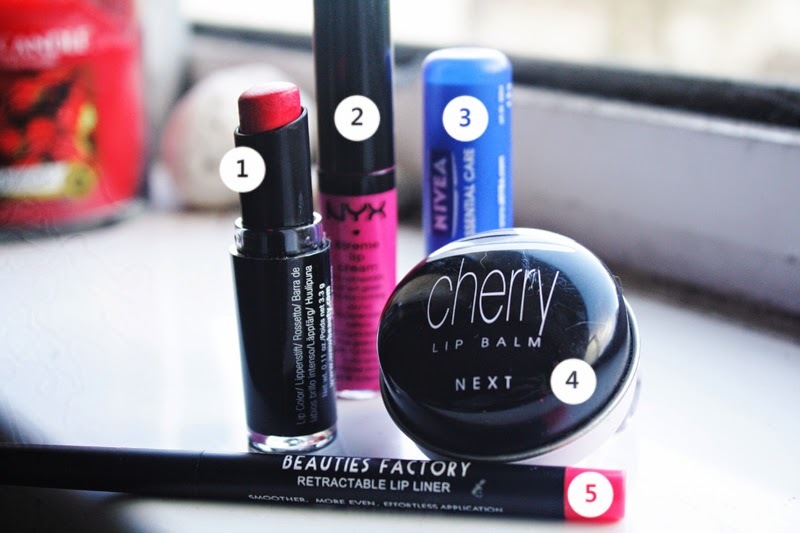 NYX Xtreme Lip Cream: Another amazing product sent over from America from my best friend. HOT PINK. I've never been one for such bright lip colors but there is something about this. It goes on like a lipgloss but dries like a lipstick. Another product that stays for hours with out touch ups. 4. Beauty Factory Lipliner: A random online purchase that ended up to be worth every penny. I bought in a very hot pink and I wear it under any bright red or pink lipstick possible, And as always, long lasting! 5. NEXT Cherry Lipbalm: This is just what I pop in my purse everyday. It has a redish tint so it's great if I get bored of my naked lips during the day. It's funny how your everyday makeup routine seems short and like there isn't much in it until you take a picture like this. I know I said this quite the bit during this post but I never have to touch up my make up during the day. It stays for HOURS. So if you get the chance try to check out some of these brands. If you could only live with three make up items for the rest of your life what would they be?